Durlston Castle is located in Dorset, just outside the coastal town of Swanage in the southeast of the Isle of Purbeck. 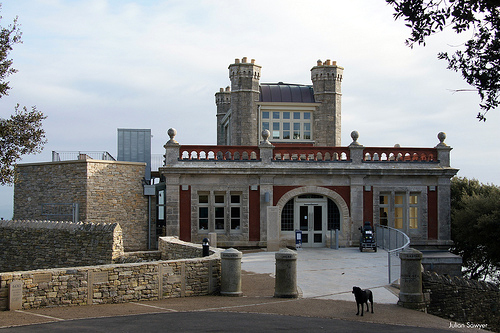 The Castle now houses a new Visitor Centre and is a focal point within Durlston Country Park. The park is the gateway to the Jurassic Coast World Heritage Site, which is also a designated Heritage Coast, a Special Area of Conservation, a Site of Special Scientific Interest, an Area of Outstanding Natural Beauty and a National Nature Reserve; with offshore waters being part of the Marine Research Area. This historic location is almost unequalled in Britain for its diversity of wildlife, its numerous species of birds, wildflowers, moths, numbers of butterfly that use this location to breed, and thousands of other invertebrates that can be found here. John Mowlem (1788-1868), a Swanage-born man, was a stonemason and builder. He was the founder of the quarrying and construction company Mowlem. He and his nephew and business partner George Burt (1816-1894) wanted to give something back to their home town, which was the source of their Portland and Purbeck limestone, popular for building at the time. John Mowlem built the Mowlem Institute, a reading room and public library, in 1862. George Burt purchased an undulating tract of land covering Durlston Head during the same year. 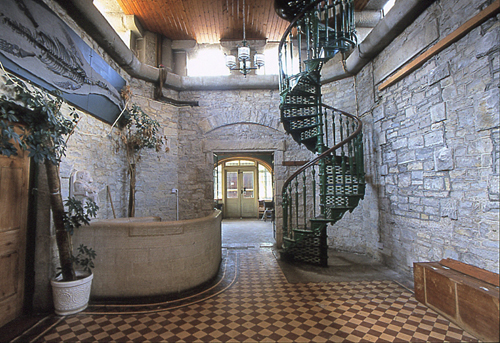 This estate, the Durlston Estate, included quarries that supplied their firm with limestone. Burt developed this estate as a tourist attraction. Burt built his folly Durlston Castle upon the crest of the hill. 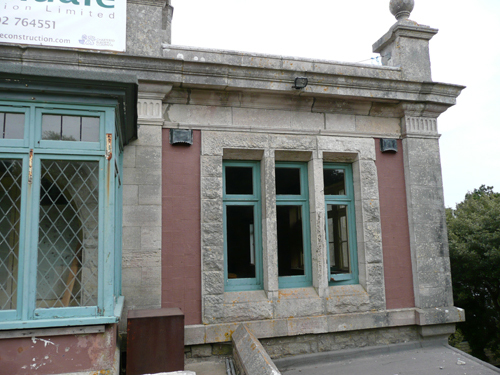 It was designed by the Weymouth architect G.R. Crickmay (1830-1907) and built by W.M. Hardy in 1886-87 entirely of local stone. The ‘castle’ was never a real castle: it was purpose-built by Burt as a restaurant for the visitors to his estate. Burt’s dream was to transform Swanage into a fashionable seaside spa. He had the Victorian zeal for learning and the natural world, leaving behind him a legacy of artefacts such as the Great Globe, a huge sculpture of a globe made from 40 tons of Portland limestone; and cast iron bollards from many parts of London, all linked by the cliff top footpaths with Victorian panels that offer either poetry, or interesting facts. Add to this the huge variety of plants imported from around the world and Burt had the makings of what he hoped would attract a small number of individuals wishing to make Durlston Estate their home. Burt’s dream never came to fruition, although 88 plots of freehold building land were offered in 1891. Fortunately for conservationists, the land remained vacant with the exception of the Castle, the Great Globe and the bollards. The castle played a part in the evolution of radio and telecommunications. A team of Marconi’s engineers used the roof of the castle in the 1890s for some of their early wireless experiments to transmit to the Isle of Wight. 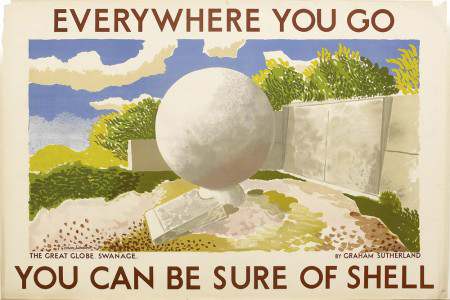 During the 1930′s a Shell advertising poster had an illustration of the Great Globe rendered by Graham Sutherland; and during World War II there was a radar station used for guiding pathfinder bombers, but it wasn’t until 1944 that RAF Durlston Head was added. At the close of WWII the RAF huts were used for emergency housing and were not demolished until 1974, shortly after Durlston Park was created. 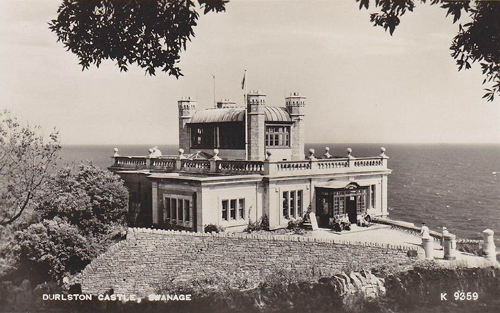 The castle passed through the hands of many owners until in 1973 it was bought by Dorset County Council. The side wall of the castle features a sundial and two stone tablets inscribed with various statistics such as clock times and tides around the world. South of the castle is the Great Globe. All around the estate there are further stone plaques carved with quotations from Shakespeare and the Bible, maps showing the English Channel and the United Kingdom, and further facts about the natural world. These surrounds were placed during the period 1887 to 1891. Also within the Durlston Country Park and within walking distance of the Globe are Durlston Bay, the Tilly Whim Caves and the Anvil Point Lighthouse. The Park is part of the Jurassic Coast World Heritage Site. The Jurassic Coast stretches over a distance of 155 kilometres (96 mi), from Orcombe Point, near Exmouth, in the west to the Old Harry Rocks in the east. 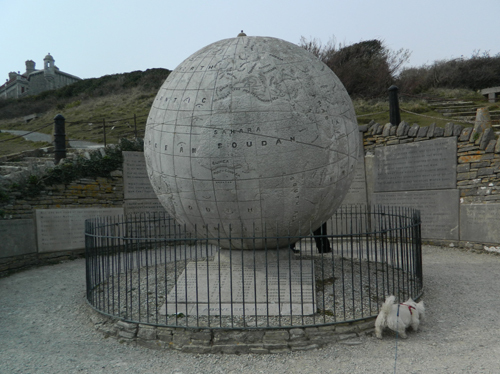 Durlston Castle and the Great Globe were both restored over 2010 and 2011 by the Council and I was employed to examine the external joinery and ironwork.